When uric acid remains soluble together with proper hydration you are able to expel the excess uric acid from your body more easily. The herbs in the GC capsules help in this process by enabling the digestive system to work more efficiently helping to keep the gout at bay. This can be continued by adding a balanced healthy diet to the increased hydration and GC capsules. 90 capsules per bottle which is approximately 1 month's supply. the bottle(s) back for a full refund. GOUTCARE (GC) is our signature herbal blend. We have assisted people in living a pain free life since its introduction in 1998. Gelatin, Magnesium Stearate and Silicone Dioxide. Does not contain wheat yeast, corn or preservatives or dyes. There are 3 parts to managing your gout with GoutCare (GC), all of which are carefully described in the information that we send you with your order. Ongoing awareness of the effect of food purines and diet. If you look at your uric acid metabolic process (The cause of gout) as a 1pt glass, then let us assume that when you are young your glass is 1/3 full. After years of eating foods that are high in purines your glass fills to 7/8th full. If 1pt is the level that results in a gout attack, an average meal in purines may bring you up to just under 1pt but luckily your body within 4 to 6 hours can brings it back down to 7/8th full. However one day the uric acid rises above the rim of the glass and you are now under a gout attack. With the initial low purine diet, correct water intake and GC capsules you can successfully bring that glass back down to 1/2 pt. It will never go back to 1/3 again, but at 1/2 pt you can now manage your uric acid levels and avoid future gout attacks. We send you all the information you need to follow the above program. 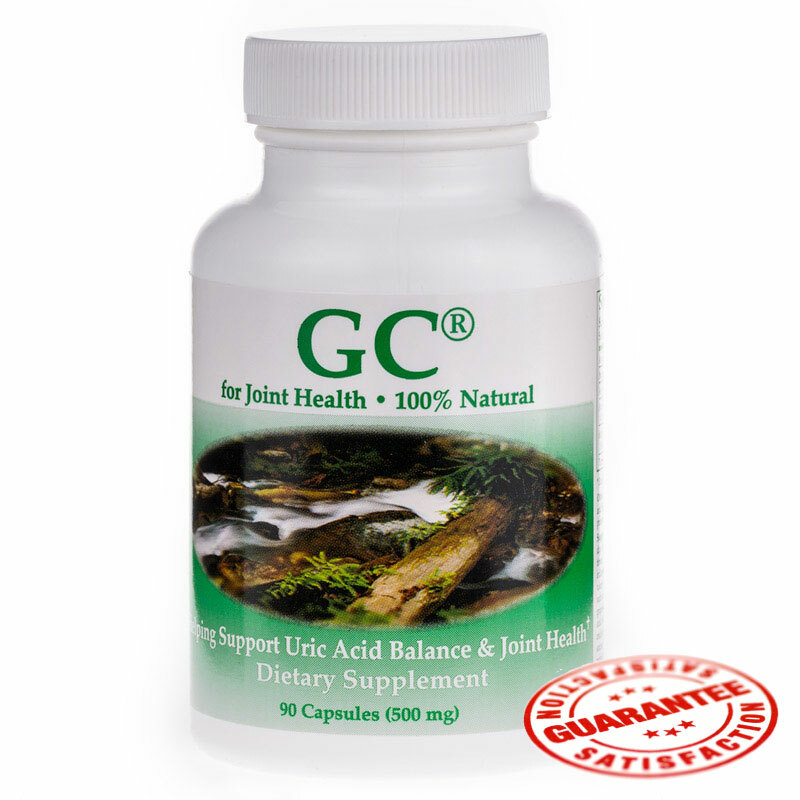 Been using GC for a number of years now and found it kept gout at bay combined with plenty of water and high purine foods. Bought for son who is, so far, delighted. He is a teacher who spends most of the day on his feet which is very difficult when in serious pain. Not easy to get a young man to talk about these things but I understand things are much better. Also bought him tart cherry pills. He is taking both. My husband has had gout now for over 7 years or so and tried lots of different things. Touch wood he started this product with the pro biotics about 6 months ago and to date no gout. Has adjusted his diet as well. Great product and service. Thanks. Such a good product for gout, the joints feel better after a week, only downside is I feel a little anxious on the detox, I'm prone to anxiety so I personally drink chamomile with it. My partner has used this product on several occasions, always with great success. I never thought that I should need it! However, I have found the cure most pleasant and, with the excellent guidelines you have provided, I hope to remain pain free for the foreseeable future. I do know where to come, though, should gout rear its ugly presence again.